This year, rainy season ended much earlier than usual year. In our main genryu fishing field Tohoku, generally the rainy season ends around middle to end of July, but it ended by the end of June this year. As soon as July came, the summer had come. The sun was shining and glittering strongly every day. I do not like the rainy and humid climate of the rainy season, but when the rainy season had ended so soon, I was concerned about the shortage of water. Not to mention growth of agricultural crops, I was also worried that the genryu in the summer would not be drought. In mid-July, on the three consecutive holidays including the marine day, I went to Arakawa flowing on the south side of the Asahi mountain range with 2 friends, Go-chan and Ubi-chan. 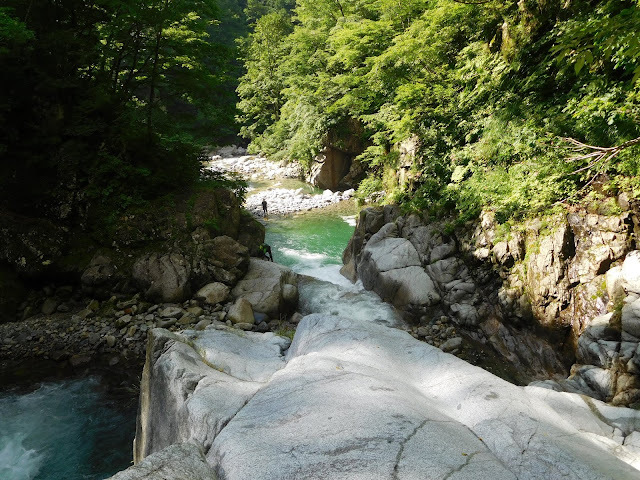 Arakawa genryu area is a beautiful mountain stream that runs through white granite river-bank, and the stream is surrounded by mountains of 1,500 meters to 1,800 meters and untouched forests of beech. 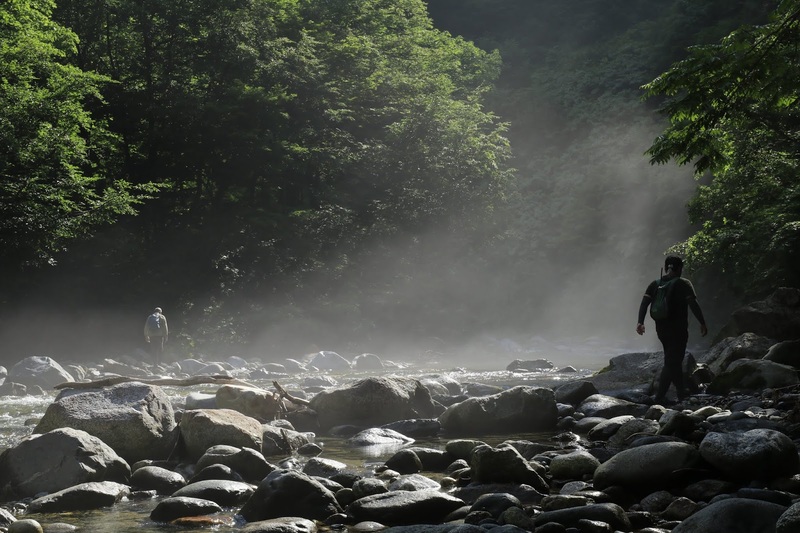 For me Arakawa is a stream that I have fished many times already, but it is the first genryu in Asahi Mountains for Go-chan and Ubi-chan. 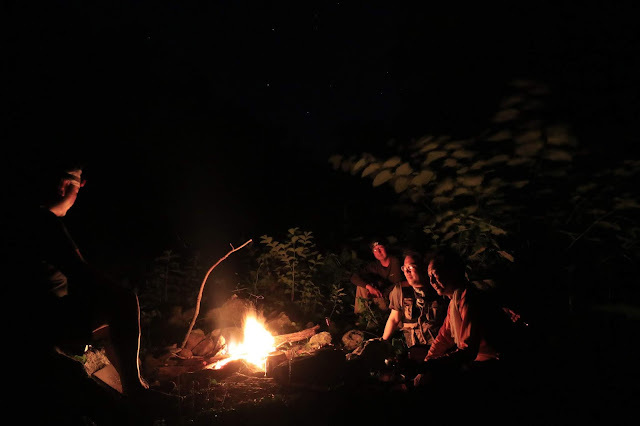 Tenba (Camp site) is only 2 hours walk from the car parking, and we can use the climbing trail up to the tenba. 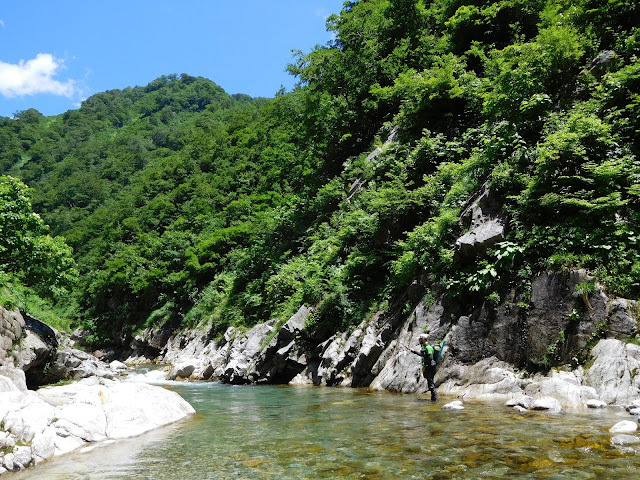 In this fishing trip, we planned to stay at this tenba for 2 nights and aimed to go to the upstream waterfall called “Magari-daki” that I have never been before. 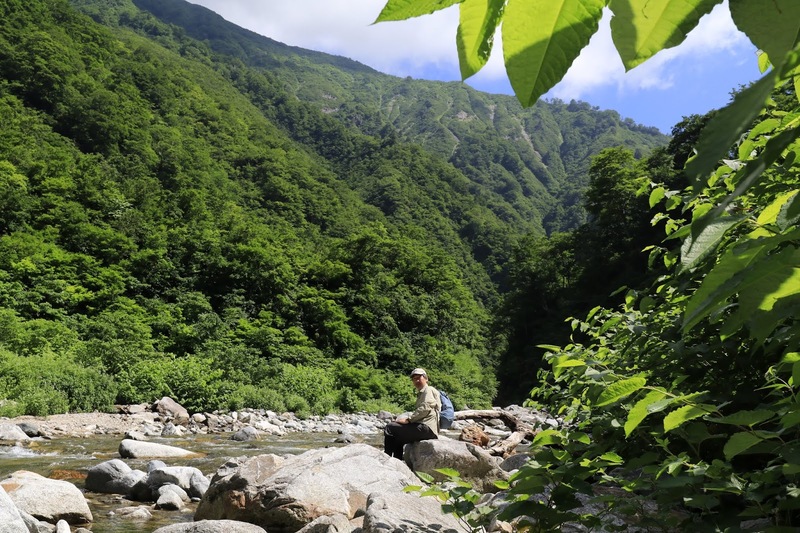 A little while ago when I visited Sebata-san at Bansho in Tadami, as I talked about this fishing trip, Sebata-san said, "There must be still snowy bridges remaining in mid-July and it might be impossible to go to Magari-daki." However, we did not have much snow this year, so I thought that it would be fine in the middle of July as expected. When we arrived at car parking lots by Arakawa, as the weather forecast was very good for the three consecutive holidays, there were 5 or 6 cars were parked in the parking lots at the gate of the climbing pass already. Early in the morning, when nobody had gotten up yet, we started walking up the mountain path. Arakawa's climbing path continued upstream along the river, so there was no hard climb. We walked breathlessly in the deep forest where stunning beech trees are scattered. We crossed three suspended bridges that gradually became poorer, and when the sun appeared over the mountains, we arrived in Temba. 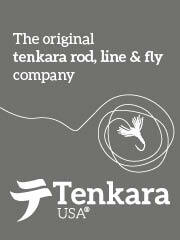 Around the time the Tarp and the Blue Sheet were set up in the tenba, 2 anglers were coming down to the stream. We exchanged greetings. 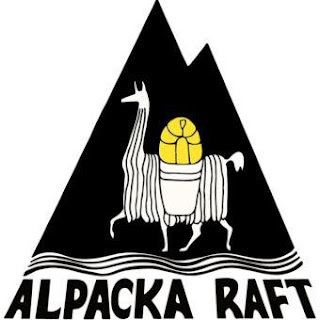 They said "We will stay for one night, so we would like to go to the tenba of about an hour and fish around there." I said “OK, then we will fish lower part today.” “We will take care walking not to spook fish” they said and walked to up stream. We had a break for a while and prepared for fishing. Go-chan said he would like to fish near tenba and have a little nap today. I could understand him because we only slept for 2 or 3 hours a night before. Ubi-chan and I decide to fish up to Masudome-no-taki (Trout Stop Water Fall) which is about 1km up-stream from the temba. Arakawa in this section is surrounded by un-touched deep forest of big old beech trees, and stream flows slowly with a large amount of water. I thought fishing might be a tough condition because it was already July and many fishers walked and fished around this area, but contrary to expectations, the fish showed good reactions to our kebari. 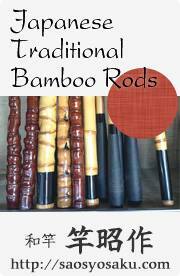 There were nice sized iwana of 24-27 cm vent our rods at every good point. Apparently the two leading fishers seemed to have walked so as not to rough the fishing points. 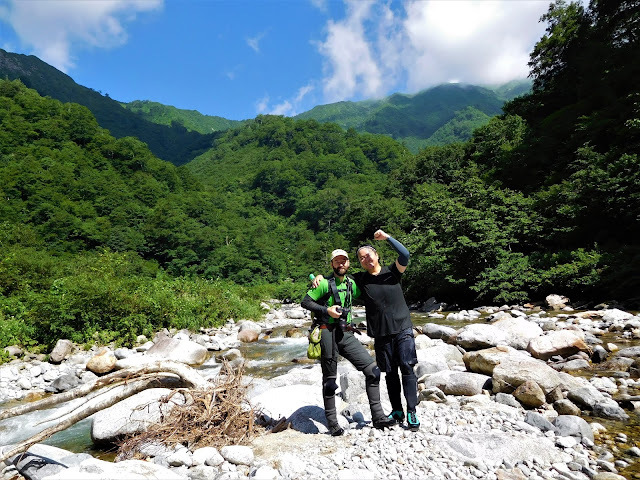 Ubi-chan and I enjoyed fine fishing up to Masu-dome water fall. We had lunch under the water fall and walked back to the tenba. When we arrived at the tenba another 2 guys lookd ike fishers were resting by the tenba. I said hello to them, then one guy told me “You are Okushi-san, aren’t you?”. He was a genryu fisher that I once met in the keiryu and talked for a while. They were wanting to stay at this tenba, so we welcomed them to set a tarp by our place. Luckily there was enough space for one more tarp. I said, “Let’s drink together tonight.” “Yes, of course.” they answered with smile. We started bonfire around 5:00 and prepared for dinner. That evening, Go-chan cooked lamb-chop steaks with salt, pepper and rosemary. We called 2 guys and had beer together. Lamb-chop steaks were so good. We also cooked more foods and enjoyed talking until about 9:00 pm. When noticing, the starry sky, that was promising good weather of next day, was spreading in the night sky. Next morning, we woke up at 6:30 am. When we were having breakfast, 2 young guys looked like Sawanobori (Stream trekking) were coming over. 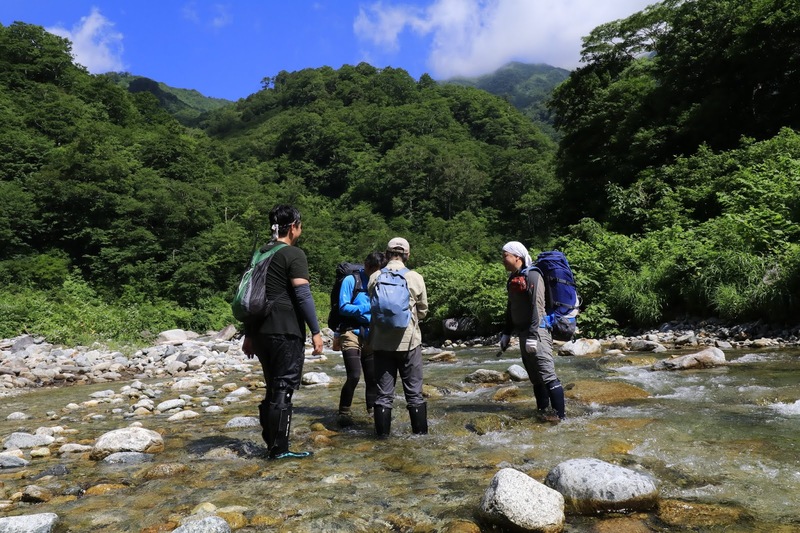 They told that they were on a day hike sawanobori and do some fishing too. We said we would probably catch up sometimes later, and we saw off them. There were many people because of 3 consecutive holidays. Well, thought that day's fishing was difficult, but I thought it was OK if we could see Magari-daki, and we left Tenba after 8:00 am. The morning mist hung over the river where the sun light was not reached yet. We aimed up-stream and walked in this fantastic scenery. It only took us 30 minutes to Masu-dome waterfall where we finished fishing yesterday. Masudome waterfall is only about 8m but it had a large amount of water and there was a huge pool under the waterfall. There was also another 8m waterfall right after Masudome waterfall. 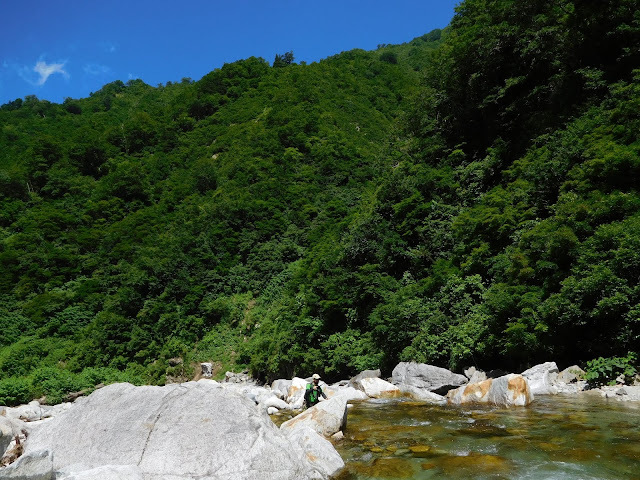 I told Go-chan and Ubi-chan how to climb over the waterfalls, and I traversed right side of the pool and climbed Masudome waterfall and waded across the rapid stream and climbed the next waterfall. Go-chan and Ubi-chan climbed the waterfalls safely. We really enjoyed this waterfall climbing. Gorge finished just upstream of the waterfall and the vast Hirokawara (Wide and flat shallows) spread before our eyes, and over there the spectacular scenery of the Asahi mountain peaks were spreaded under the shining sun and the blue sky. There were no clouds to obstruct this majestic scenery shone on the summer sun. Ubi-chan and Go-chan both were taking photos. This was the landscape I wanted to show them. I said, “Real Arakawa genryu is starting from here.” Since we have a predecessor, we took walk forward for a while. Two fishers we met yesterday came down as we walked a little. 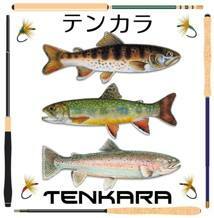 Talking, yesterday they took a tenba near there and fished up-stream. “Fishing was good.” They smiled fairly. Talking with them, I learned that they are the same locals as me. We talked for a while and said good-bye. 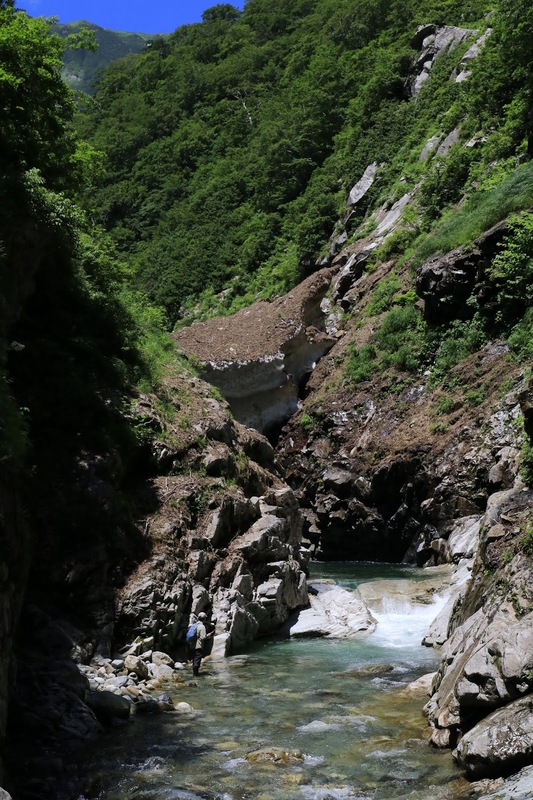 Around 9:00 am, we reached the confluence of Nabekura-sawa where a huge snow bridge lied down even in mid-June. The snow bridge had disappeared without a trace, but the mainstream was deep pool for about 30m that we can not wade or traverse, Ubi-chan and I decided to climb over the 40m high right-side riverbank, but surprisingly Go-chan swam and broke through the pool. We started fishing from the up-stream of this big pool. We fished some iwana but size was not satisfied, we knew it was because there were still 2 sawanobori guys up-stream. We walked again and then we found 2 guys about 100m up-stream. We soon caught up with them. It was around 10:30. They said they were just finishing fishing and go down the stream as they had to go home by the evening. 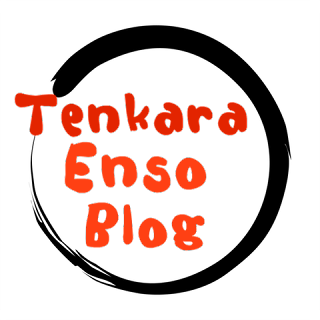 Finally, there was nobody up-stream of us in Arakawa genryu. Now, as soon as I thought that Arakawa fishing was going to be real high right, the river suddenly became little muddy. I think it was the sign that a snow bridge broke down somewhere up-stream. "In July, there must be snow bridges left." I remembered Mr. Sebata-san’s words. As we fished and walked for about 30 minutes, the turbidity disappeared. After passing a large tributary called Ohobi-zawa, the flow of mainstream became rapid, and the contrast of white granite of river banks and green forest, pale blue sky showed us a beautiful scenery of Arakawa genryu. Iwana to catch got bigger, and they bent our fishing rod comfortably. After few minutes, we faced Ex-Sakanadome Waterfall. It was only 2m high water fall, but there was no clue, I climbed the right bank acrobatically and put out the rope for Ubi-chan. As we walked for a while, the valley became the deep gorge and the compressed flow became deeper and stronger. When we turned one blind corner of the valley, there was a huge snow bridge caught upon 30 meters high valley hill. It looked like breaking and falling down any time soon. That was too huge and too unstable snow bridge. The current under it was very deep and rapid. We had to give up wading up the stream there. However, it was quite an inspiring sight. We had lunch at down-stream of that place and slowly went down the stream. The sun in summer was as strong as ever, the temperature went up but the walking in a pure flow was very pleasant. In the pool by Nabekura-zawa, high school students boys and girls sawanobori (stream climbing) group was practicing swiming supported by instructors by a rope. They said they were wading up Oh-Obisawa from now on and stay overnight in the mountain and coming down the climbing path tomorrow. We waved hands and said, "Take care and enjoy!". Everyone turned about and waved hands with a smile. This time, we could not reach the target waterfall. Moreover, it was only 200 meters from the waterfall. It was disappointing, but fishing was very good and we really enjoyed breathtaking sceneries. Also, we met more fishermen and sawanobori climbers than usual during this trip, and everyone was very nice. On the last day, we met the local elementary school students who were led by the teachers. They were on a beginner river hike tour and everyone looked enjoying the walk very much. They all said hello to us with smiles. It reminded me the smiles of the high school students who were waving hands at that pool Nabekura-zawa a day before. I was thinking that Japanese young people were still not that bad.